He’s big. He’s bad. He’s… innocent? 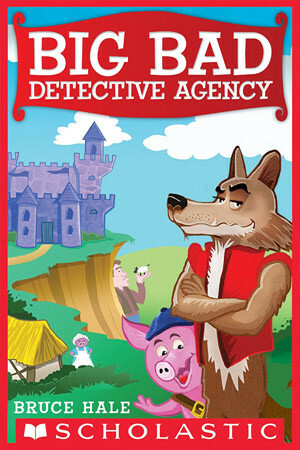 When the houses of all Three Little Pigs are ransacked, the prince accuses Wolfgang, the Big Bad Wolf. Now, the wolf has only one day (with the help of the fourth little pig) to prove he didn’t do it and clear his big bad name. 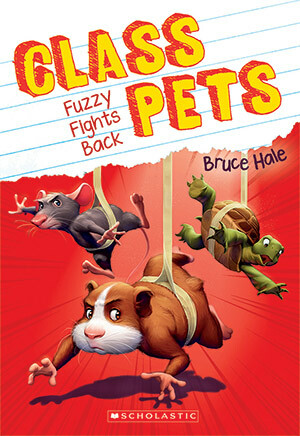 Hale, author/illustrator of the successful, Edgar-nominated Chet Gecko series, clearly has a lot of fun with this dip into fairy tales for his new series of humorous mysteries. 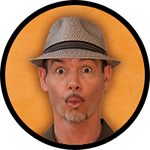 Funny and flip, like Saturday morning cartoons. Simple sentences and repeated phrases give this easy reader plenty of accessibility. Cartoonish black and white art depicts lively critters and a refreshingly diverse human population for a fairy-tale world. Readers will be happy to return for Wolf and Ferkel’s next big case.